When I work on files in python, I sometimes mistake tabs for spaces and vice versa. Is there a way I can get Vim to display a character for a tab instead of a tab? If you put these two lines in your .vimrc, tabs will be shown as > for the start position and - through the rest of the tab. The basic answer is :set list, which causes tabs to display as ^I. doesn't look good, especially when you expect the g of g++ to appear under the first p of cpp (assuming tabstop=8). fill the space that the tab normally occupies. ">---". When omitted, a tab is show as ^I. These characters are distinctive enough that they rarely appear literally in document text. To type these special characters into your vimrc, type Ctrl-vu23CE while in Insert Mode, as explained in :help utf-8-typing. To remove the highlighting, simply type :noh which is short for :nohlsearch —no high lighting.
" Highlight tabs as errors. For more of these useful highlighting commands —including combined with trailing whitespace and making this permanent— see the Vim wiki. 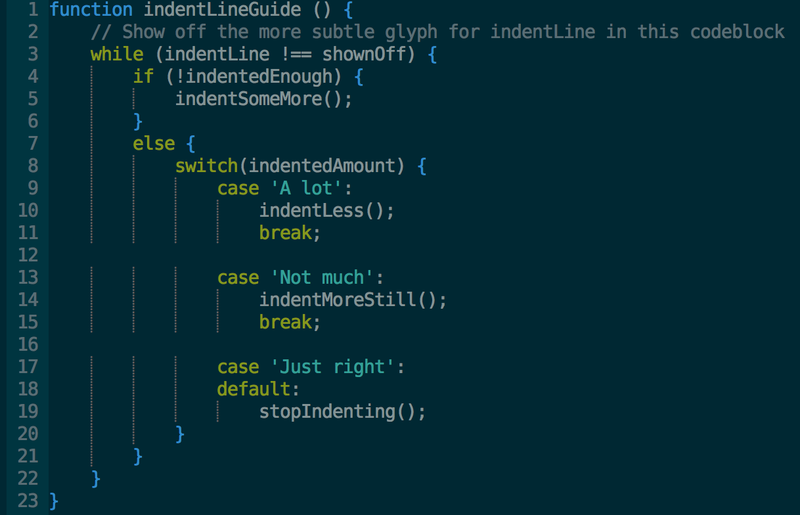 I personally like the use of the plugin indentLine, which displays a vertical line at indentation levels. It is of great help especially in python, where the indentation is important. Among other things, it provides a toggle command, that can be mapped to a key combination, so that you can turn it off, when you don't need it. Easiest method is to do :set list, which will show tabs as ^I and end of line as $. to toggle between regular display and list display. This allows me to quickly check if there are tab vs space problems and then go back to a regular display. You may want to show tabs differently in a regular terminal and gvim. (Adding for completeness, in case others find it useful). Not the answer you're looking for? Browse other questions tagged whitespace tab-characters or ask your own question. How to differentiate visually the white spaces in vim? How to view tabs as conventional whitespace, not as control character ^I (caret I) in VIm? Why are <tab> characters variable width? How to show 2 spaces as tabs in listchar?